Designed for use in traffic applications, the red reflective markings enhance visibility and road safety. The back is made from 100% UV stabilized advanced plastic composite (asa), ensuring strength and durability. 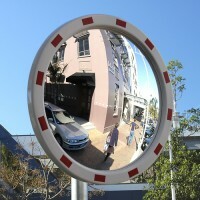 This 24" Reflective Safety Mirror is designed for use in traffic applications with its red reflectiv.. 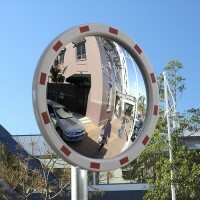 This 32" Reflective Safety Mirror is designed for use in traffic applications with its red reflectiv..